by Frances Burney Author · Orson Scott Card Author of afterword, colophon, etc. 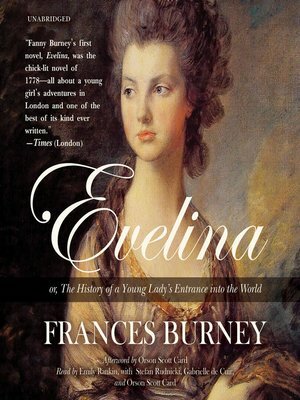 Originally published in 1778, Evelina is Frances Burney's first and most beloved novel. It was a landmark in the development of the novel of manners and went on to influence such enduringly popular authors as Jane Austen. By turns hilarious and grim, witty and lyrical, the story follows young Evelina as she leaves the seclusion of her country home and enters into late eighteenth-century London society—both its pleasures and its dangers. Life in eighteenth-century England is vividly rendered as Evelina is educated in the ways of the world and, eventually, love. As she battles such cruelties as social snobbery and delights in such thrills as pleasure gardens and balls, Evelina strives toward her final triumph, while capturing the hearts of listeners everywhere along the way. Frances Burney (1752-1840) was a British novelist, diarist, and playwright. In total, she wrote four novels, eight plays, one biography, and twenty volumes of journals and letters. She is best known for her landmark work Evelina.